It’s been so long since I’ve written a blog post, that I almost feel uncomfortable here at my computer this morning. But, it’s time. The Lord has been doing some things in me and around me that I just couldn’t share with you. Some of it is too personal…some of it isn’t really my story to tell….but, today, I feel like I need to share a few things to encourage you. It’s Christmas. It’s actually here. A time of year that we anticipate all year long. Not because of the presents (although I LOVE to give presents.) But, because of the time with family. Because of the happy memories of all our Christmas’ past. Because of the Spirit of Christmas and the reminder of what our Savior did. Because of the joy of the season. On May 2 of this year, I anticipated a very different Christmas this year. One without my husband. But, because God is so good, here we are, celebrating Christmas with a “chubby”, grey-bearded husband, dad, son, son-in-law, friend, cousin….with Clay! Thank you, Jesus. My greatest gift this year is another Christmas with him. 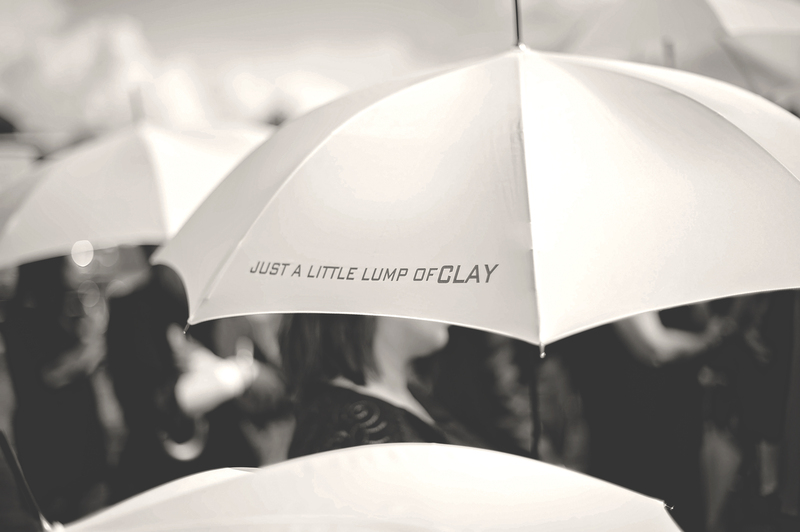 So, I put the word chubby in quotes because I mean chubby – for Clay. Not chubby for most people. You know, he’s been small his entire life. I never, in a million years, dreamed that he would gain weight. In fact, I’ve said many times that I was positive he would be a size 30 waist for the rest of his life. Well, I was wrong. Steroids can really change a person. But, he looks so good as a chubby man. Ha! We have seriously laughed about it. He’s like Tim Allen in The Santa Clause. He’s gained 30 pounds in a short period of time. He was eating constantly and having major sugar cravings. He keeps growing his beard out and it is turning very grey. I just looked for a good pic of just him, but this is the best one I have right now. Isn’t he cute??!! So many of you have asked me how he’s doing. The answer is that he’s doing really well, especially considering the circumstances. He still gets a little tired, but he doesn’t nap as much as he did before. His thoughts are much more clear and the “fog” that he described in the early months seems to have lifted. He hasn’t been sick, his blood levels have been completely normal, he is working and doing everything that we do as a family….ballgames, Christmas parties, church, shopping…we even went on a vacation and he did great. He was getting dressed this morning and he said to me, “Do you realize that I haven’t even caught a cold this entire time?” He often acknowledges how much God has helped him. On December 5, we had an MRI done. The report came back to say that the tumor is shrinking. In fact, significantly. They believe it is about 30% smaller than it was at the last MRI, just 8 weeks prior. The change is attributed to the Avastin. Avastin is the drug that was introduced just after the first MRI, which was not good. So, you would probably assume that we had a really good day on December 5, right? Oddly enough, it was a hard day for me. And it started a new phase of my coping. I went into a fog. It was my turn. I’ve come to recognize that, just like there are phases of grieving, there are phases of coping with a situation like this. In the beginning, I was running on adrenaline. There was always a decision to make, a doctor to see, a test to run, a treatment to make, a person to visit, a story to tell. Then, suddenly, everything seemed to stand still as we tried to figure out what the new normal looks like for us. Everything about our life, before May 2, was entirely normal. Now, I have no idea what will happen from day to day. When I think about the future…. Before, it was so clear. Images of what life would be in 10, 20 or 30 years, would so easily just flash across my mind without any work on my part, or effort to figure out what it would look like. I see fuzzy images that won’t come into focus. I strain sometimes to see them and to make them become clear, but they won’t. My flesh has visited our home quite frequently lately! (smile) Without giving you too much detail, because you might not see me the same, I’ll just tell you that in my fog of confusion and wondering, my flesh became much more alive. I’ve lost my patience, made my own decisions, allowed frustration to come, allowed some anger to rise up, and various sorts of other sins…. Sunday morning, I knelt at the altar and asked the Lord to forgive me. To have compassion on me. To help me crucify my flesh. To help me leave all my burdens there at the altar with Him. He is so much better at carrying them that I could ever be. Why would I leave that place with them? Who knows why we do this? But, I laid everything down, once again, and He forgave me. He loved me. He wrapped His arms around me. He showed me compassion. And, when I got up from the altar, we sang this song. It’s an oldie, but such a goodie. I like what Darlene says at the beginning, “Let your heart sing!” Listen to this while you read the rest of this post. All I could do was thank Him for the promise I have in him. Nothing compares to it. NOTHING. Not a healing, not life on this earth, not millions of dollars, not contentment, not dreams of my future on earth, NOTHING. Nothing that I understand could ever compare to the hope I have in Jesus. The hope I have in life after this earth. So, I sang for joy at the work of His hand. I sang for joy and praised Him for His love, His mercy, His forgiveness, His comfort, His peace, and His hope! I just stood there and thought about all the blessings of God in our lives. I thought about how He’s parted our Red Sea. I thought about how He has carried us through. I looked over at Clay and thought about how He is ready to see Jesus, or be healed….he fully accepts whatever God chooses. I looked at my kids and thanked the Lord that they are standing by us. God is working in their lives, just like He is working in ours. So, if you are having a hard time being “merry” this Christmas, I encourage you to set your mind on things above and remember the promise you have in Jesus. Ask Him to take your eyes off of this world, and help you focus your eyes on heaven. Focus on the hope we have in Him, and all the troubles of this world will fade away. Sing for joy! Sing! Give Him thanks. As you sing and rejoice, the joy will come. I promise. I also constantly thank the Lord for all of you. You have blessed us more than you’ll ever know on this earth. Here are a few highlights from the past month…. Clay’s cousin, Chris, and his family came to see us, all the way from Virginia. They stopped to visit Clay on their way through town. His aunt Mary and cousin Stacey came with them. We had such a sweet visit and all I could think about is how many people have taken time out of their very busy lives to visit Clay. You will never know how much it means to him. He feels so loved….we all do. Chris and Jan brought their 4 kids, Harrison, Adeline, Cooper, and Bea. They were so well behaved and so compassionate. I was taken back by the way they loved on Clay. When they said, “We are praying for you,” I knew they meant it. I love young people and how God can do great things through them. Age is not a factor to the Lord. All four of these beautiful young people really ministered to us that day. I was planning to just be the photographer, but everyone said, “You need to be in it.” Thank goodness for selfies! Ha! For the 3 days before Thanksgiving, our church had a time of fasting and prayer. Much of it was focused around praying for the sick in our church body. It was such a good time for us. And the timing was perfect. We needed it so much. We went to prayer everyday as a family. God has been doing so much. He is so good. The highlight was that Ben decided it was time to be water baptized. He gave his heart to Jesus a few years ago, but he struggled with the idea of being in front of the whole church and getting baptized. Clay was praying with him one day during our fast, and Ben decided it was time. The most special part was that Clay baptized him. Look at the smile on his face! Ben was literally beaming. I guess Clay is beaming, too. I’ll never forget it. I’ll tell you more about this later, but I had a well-timed, wonderful visit from two of my high school friends. Meredith and Dawn stayed with me for a few days. We laughed, stayed up late, ran a 5K, talked about deep things, drank coffee on the patio, and had very special girl time. The Lord knew that I needed it so badly. And, He used them to encourage me and lift my spirit. I love you, both, so much! Clay and I spent an afternoon in Denham at the Antique Village where my mom has a store. We had lunch with two of his co-workers from Hancock that he hasn’t see in ages – Marsha and Tanya. They shared some good memories and laughs. Then he sat behind the counter at mom’s shop while I did some shopping. At least 4 people came in and said, “How’s Clay doing?” Each time, my mom said, “Well, he’s right here. Ask him!” They have so many regular customers who have heard our story and are praying for us. It was so neat to be there and see just how many. He felt like a celebrity. Ha! Our nephew, Max, had a band concert. Clay loves jazz music, so we had a great time. He’s a very talented Saxophone player. We love you, Max. We saw Santa! Hahahaha. After begging my teenagers, we finally got a pic with Santa Clause. This will be a good memory for me for a long time. Our friend, Amy Brewer, called me one day and said, “I have something for you.” She worked at Woman’s Hospital and one of her co-workers, Jennifer Millican, gave her these Krispie Kreme gift certificates to give Clay. Jennifer reads the blog and saw the story about his love for KK. How sweet is that? Thank you, Jennifer. Look at the smile on his face! Clay got a visit from an old friend from Elementary and High School – Dale Bennett. Dale, his wife, Becky, and two sons, Jackson and Drew, stopped by on their way out of town. They laughed about old times and told a few stories. It was such a great visit for him. He got to relive his glory days as a High School Baseball Player. Thank you, Dale and Becky. Tonight begins our Christmas celebrations. And, as we celebrate this holiday season, you all will constantly be in our thoughts. We celebrate Jesus and all that He has done for us, and we give thanks for you – so many loved ones, dear friends, and family. We are blessed beyond measure. And we choose joy…we choose to be Merry this Christmas because we have a hope. A promise. And nothing compares to that promise. Amen!